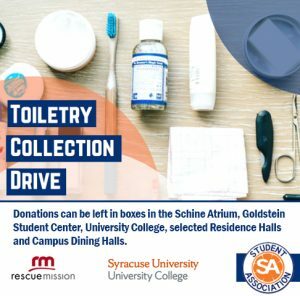 University College and the Student Association are partnering with the Rescue Mission to hold a collection drive to gather toiletry items for those in need. The campus-wide initiative will take place from March 19-30 as part of SU’s Philanthropy Week. Collection boxes will be placed in the Schine Student Center, University College, Day Hall, Flint Hall, Brewster, Boland and Brockway Halls, and Ernie Davis Hall. Collection boxes will also be placed in Graham Dining Hall, Brockway Dining Hall, and Goldstein Student Center on South campus. As part of this event, on March 27, Chipotle restaurant on Marshall Street will donate 50% of its proceeds from 4:00 p.m. to close to the Rescue Mission. University College staff will join students on March 30 in the atrium of the Schine Student Center to sort items collected. If you would like to volunteer to pick up or sort items, please contact Woltman at jbwoltma@syr.edu. For more information, contact Eileen Jevis at 315-443-3527 or ejevis@uc.syr.edu.